Electronic rulemaking (e-rulemaking) has been an attempt by Federal agencies to address the deficits in public awareness and participation in the administrative rulemaking process. By moving parts of the rulemaking process out of the Federal Register and onto the internet, the public will theoretically have more notice of proposed regulations and greater opportunity to participate in the comment period required for proposed regulations under the Administrative Procedures Act (APA). However, critics of the participatory possibilities of e-rulemaking maintain that many of the same problems that limited participation when the “notice and comment” period was confined to the Federal Register persist in the online process. Federal rulemaking, even when it concerns issues significantly affecting the general public, continues to be so mired down in the language of law and bureaucracy that their interpretation presents an extremely arduous task to the public. The main problem with bringing democracy to the rulemaking process ultimately concerns the complexity of federal regulation. Without a means to cut through such complexity, public comments are likely to be perceived by regulators as facile and non-responsive to the issues addressed by and the justifications for the proposed regulations. As one prominent rulemaking scholar, notes, “in order to become involved in rulemaking in a way that holds some prospects for success, individuals, groups, and firms need resources, organization, and sophistication. These prerequisites are not distributed evenly.” Parsing this statement summarizes the major obstacles faced by the individual democratic participant in the rulemaking process. “Resources” would be needed to address the often highly technical justifications for the proposed regulations: a simple visceral dissatisfaction with a proposed regulation, absent empirical opposition to the regulation, is likely to be quickly discounted by the agency. Closely related is “organization”. Organized groups are the ones capable of mobilizing capital and expertise to examine the foundations of a proposed regulation. Groups possessing the high level of organization needed to marshal supporters to comment via e-rulemaking are likely the same as those that possessed the sophistication to be undeterred by the Federal Register system. Surely a marginal increase in convenience for already established players in the rulemaking world is an inadequate realization of the lofty goals of e-rulemaking. Along the same lines as “organization” is “sophistication”. Just as effective commentators are likely to come from groups possessing the organization to overcome the logistical difficulties presented by the Federal Register system, they are also likely to come from sophisticated observers of the issue at hand. 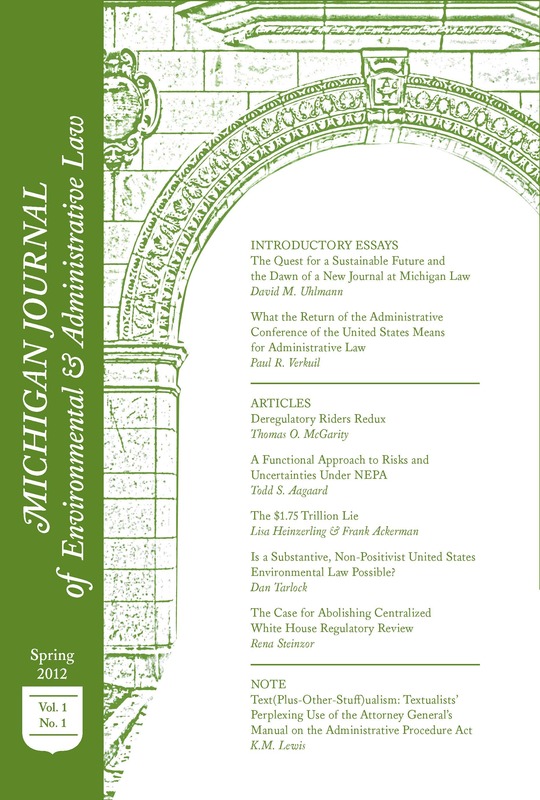 Beyond the fact that these sophisticated individuals and groups would also be unlikely to be deterred by the Federal Register system, the time and energy agencies plan to expend supplementing regulations with educational materials would be wasted on those that already have a grasp at the issue at hand. Additionally, despite such attempts to use educational materials to increase the effective participation of the public at large, it remains true that for most regulations a certain baseline of knowledge and sophistication will be needed to evaluate even the information put forth by the agencies as “education”. Commentators whose knowledge of the issue at hand is limited to the educational materials supplied by the agencies are unlikely to be able to present effectively critical comments, with such comments continuing to instead come from already sophisticated participants. In many ways, such a state of affairs is unavoidable. With regards to technical regulations, which compose an ever increasing proportion of federal regulations, even those which have a significant effect on the public at large cannot be presented for public notice in a manner that will meet the needs of both well-organized, sophisticated commentators and average democratic participants. When the needs of the two groups are in conflict, the federal government has no choice but to err on the side of sophistication. Any simplified or inadequately justified proposals will be quickly attacked by stakeholders who possess the resources and knowledge to challenge the justifications for proposed regulations. Federal Agencies have navigated around the difficulties in truly increasing effective public participation in rulemaking by focusing initial e-rulemaking efforts on topics that do not require a large degree of technical sophistication to grasp. For instance, recent topics of e-rulemaking include: texting while driving for commercial motor vehicle operators, the rights of airline passengers, and requiring e-kiosks at airports to be accessible to travelers with disabilities. While participation in such relatively minor regulations certainly represents a step forward, it remains true that in its current form, e-rulemaking has expanded access to the notice and comment process but has not led to a significant change in participation in the process. Cornelius M. Kerwin, Rulemaking: How Government Agencies Write Law and Make Policy 111 (3rd ed. 2003).